Perhaps due to its remote and isolated location, or maybe because of the magical way the temples are built, Mnajdra conveys an energy and spirituality so strong you feel you can almost touch it. Filfla (a small islet on the southern coast of Malta) on the horizon adds to this mystic feel, and for sure had the same effect on the temple builders who made special windows in the South Temple through which you can take a peek at the tiny islet. The Mnajdra temples are located near the village of Qrendi in the South of Malta and in close proximity of the Ħaġar Qim temples. The temple complex consists of three structures from different prehistoric periods, with the oldest one possibly having over 5500 years. These are known as the East Temple (the oldest), the South Temple and the Central Temple. From other remains around the area, archaeologists believe that the site could have also contained other dwellings. The South Temple at Mnajdra is the most famous of the three. It is aligned with the four seasons, and if you visit the temple at sunrise on the first day of each season you’ll have a remarkable experience. As the sun rises above the Ħaġar Qim hill, a ray of sun enters the main door and hits one of two large slabs on the inside of the temple, depending on the season. Both slabs are decorated with hundreds of tiny holes. Might the ray of sun penetrating the temple symbolise the act of fertility? Could each tiny mark on the slabs represent the birth of a child? The central Temple, which is also the youngest of the three, has two peculiarities: it is built on an artificially raised platform and has two main doorways. One may also see an exquisite example of prehistoric graffiti: an engraving of a temple facade on a large upright stone within the temple. 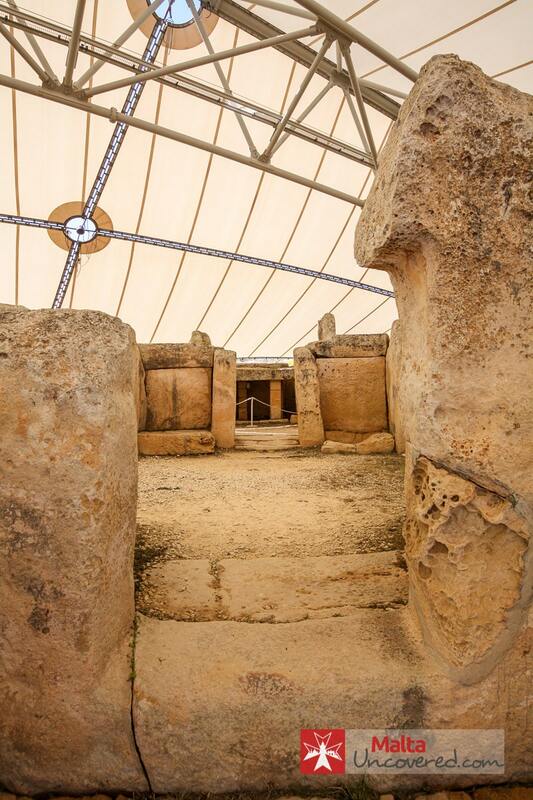 Visiting the South Temple at Mnajdra during the first day of each season is a remarkable experience. A ray of sun will penetrate the main entrance of the temple and hit one of two stone slabs inside the first apses. Special events are in fact organised for the Spring and Autumn Equinoxes and the Summer and Winter Solstices by Heritage Malta. The remote location of Mnajdra is in itself a worthwhile reason for visiting. You can take a walk along the cliffs and if you’re feeling adventurous you might even want to head down to the water’s edge. If you only have time to visit one temple, visit Mnajdra and Ħaġar Qim. Apart from a few of the best temples there’s a visitors’ centre that provides rich information on these sites. To get to the Mnajdra temples by bus you can take bus number 74 from Valletta. The trip takes about 1 hour. You can easily combine a visit to the Mnajdra temples with Ħaġar Qim due to their close proximity. The entrance ticket fee covers a visit to both sites. You can also take this half-day Temples tour through which you’ll also visit the Ħaġar Qim temples and the Għar Dalam cave, including pickup/return from your accommodation. Closed on 24, 25 & 31 December, 1 January & Good Friday. Fees include admission to the Ħaġar Qim Park (Ħaġar Qim Temples, Mnajdra Temples, and the Visitor Centre).